The Bushnell Tour Z6 Golf laser rangefinder with JOLT is highly accurate, lightning fast and easy to use. Made by one of the most respected names in the industry, this rangefinder is used by the pros, and it’s easy to see why as outlined in the article below. What Are The Bushnell Tour Z6 Features? In just an instant, the Tour Z6 can acquire flags that are 450 yards away. With lightning speed and a fantastic range, this model is accurate to 1/2 yard, offers 6x magnification and diopter adjustment. As far as durability is concerned, this rangefinder is built to withstand rugged conditions. With metal housing that’s rubber armored, the Z6 is fully waterproof. No matter the weather conditions, this rangefinder can come along for the ride. It is tour certified too, so it can legally be used during tournament play. In PinSeeker mode, the Z6 will automatically acquire the flag without capturing background distances in the process. When the rangefinder does detect more than one object, the closest one will be displayed on the LCD screen. The PinSeeker mode also features JOLT technology, which delivers quick vibrational jolts to let you know that the laser has acquired and locked onto the flag. The 2nd generation ESP (Extreme Speed Precision) calculates yardages more accurately and even faster than before. The accuracy is so precise that between 5 and 125 yards, the Z6 displays distance to 1/10 of a yard. No matter your skill level, this rangefinder will ensure that you know the exact yardage with every shot you take. Built with Vivid Display Technology, this rangefinder improves clarity, contrast and light transmission for superior optics. At the same time, the digital readout information is brighter and easier to read, allowing for quick identification in any lighting condition. How Does the Z6 Work? All of the laser rangefinders offered by Bushnell use a Class 1 laser beam, which is safe and invisible to the eye. This beam bounces off objects in the distance with just a simple press of a button. The digital clock inside of the rangefinder calculates the time it took to reach the target and return. Using advanced electronics, the rangefinder then calculates the distance and displays the range in yards or meters. It takes less than a second for this entire process to complete. 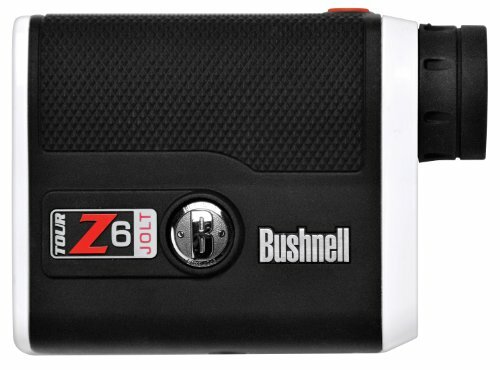 What Are The Advantages & Disadvantages Of The Bushnell Tour Z6 Jolt? There’s one thing everyone can agree on: the Z6 is lightning fast – astoundingly fast! Background trees and objects don’t fool the rangefinder easily, but if you do have trouble locking onto the flag, it only takes seconds to take several readings. The bright red display (which users actually love) makes it easy to see the readouts, even in cloudy or extremely bright conditions. The Z6 is also incredibly easy to use. Even if you have never used a rangefinder, you can take this model from box to the course in just minutes. There are two minor disadvantages to consider with this product. First is that, it may take a few tries before the rangefinder locks onto the flag. Considering it takes just a second to calculate ranges, this isn’t a big deal. The second one is that, a few users have also noted that the vibration feature does not work 100% of the time. The vibration, or JOLT, feature does not affect the accuracy or the speed of the Z6, so this is merely a small inconvenience. How Does the Tour Z6 Jolt Compares to Other Rangefinders? The Tour v3 Slope is one of Bushnell’s most popular rangefinders, and it does come with some advantages. For starters, it takes slope into account and adjusts swing yardage accordingly. This can be very useful, but it’s missing a few key components that the Z6 offers, such as: 2nd generation ESP, waterproof housing and Vivid Display Technology. The Pro X7 and the Z6 are very similar, but the X7 has a slight edge on the Z6. Its range is a bit longer, and it offers higher magnification. However, the X7 comes at a higher price. The accuracy is the same, and the optics are the same. Unless you require longer distance calculation, there’s little reason to spend more on the X7. The Z6 is precise and quick. It’s durable, boasts a long battery life, and offers superior optics. No matter the weather, the Z6 will be right by your side to help you improve your game. With advanced EPS2, Vivid Display Technology and the ability to ignore most background objects, this is one rangefinder you want to have out on the course with you. This is a high-quality rangefinder and has a very high user rating of 4.8 out of 5 stars. 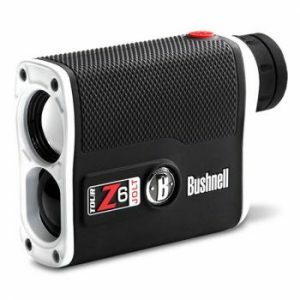 If you are looking for a golf rangefinder, the Bushnell Tour Z6 comes highly recommended. Click here to check out the Bushnell Tour Z6 rangefinder!